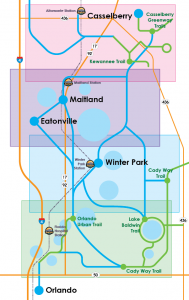 The Seminole Wekiva Trail has long been a pleasant but rather monotonous route for cyclists, joggers and walkers. 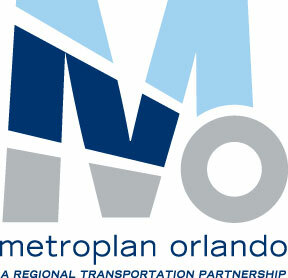 The round trip from Lake Mary Blvd. to State Route 434 measures about 10 miles precisely. A casual cyclist can easily complete that circuit in about an hour, a more seasoned rider can do it in significantly less time. The mainly tree-lined path attracts quite a few people, but minimal interaction takes place between them. After all, exercise is serious business. Armed with pedometers, odometers, GPS systems, smart phones, and headphones, trail users are safely insulated from fellow participants. That has begun to change — due in large part to the work of a whimsical local artist, Jeff Sonsken. Toward the end of 2012, Jeff found himself with some free time when demand for carpentry services — his trade — lagged, as did the economic recovery. 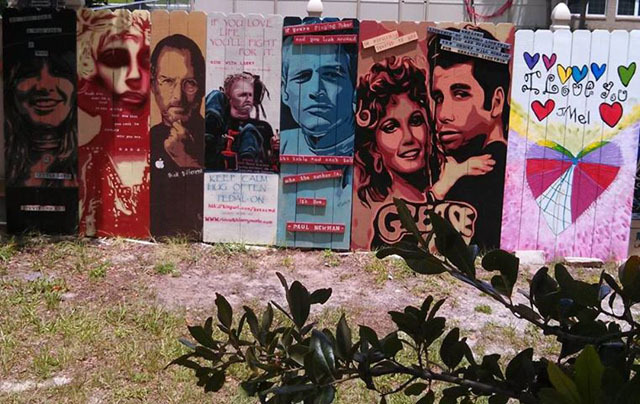 Not one to sit around, Jeff started creating paintings and attaching them to fence sections behind his parent’s house, which faces the Seminole Wekiva Trail. Certain he would be reprimanded by local authorities, he put a few images up and waited to be “caught.” Well, “caught on” was more the case — the neighbors loved the paintings, as did cyclists, joggers, and walkers. 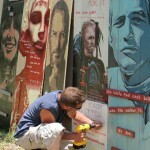 People began to stop and admire them…and make suggestions for additional panels. Jeff was interviewed by Fox 35. He was also named “Seminole County Artist of the Year.” Jeff’s paintings range from rock stars like Jim Morrison of the Doors and NASCAR legend Dale Earnhardt to icons such as Anne Frank and Ghandi. 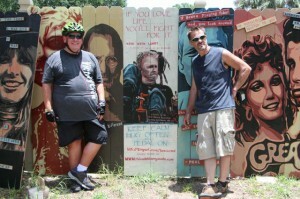 As more images were affixed to the fence along the trail, an interesting phenomenon began to take place: people using the trail began stopping to look and admire the panels. They also began to talk to each other. The Art was creating Community. A new panel was recently installed on the trail along the section just north of Dixon Rd. It’s a bit different than many others. This one is a dedication to an event that took place two years ago called “Ride With Larry.” This was a 300-mile bike ride across South Dakota led by a gentleman named Larry Smith. It was particularly special because Larry had lived with Parkinson’s Disease for over 20 years. He rode a Catrike three-wheeled recumbent and was accompanied for the first four days by his wife, Betty, and a core group of friends and family. The number accompanying him swelled to about 150 on the last day — a 65-mile route from Sioux Falls to Larry’s hometown of Vermillion, SD. Everyone in the town came out to welcome him back with signs, cheers and tears. It was the American hometown reception at its best for their beloved local baker who everyone admired for his grit, determination and love of life. 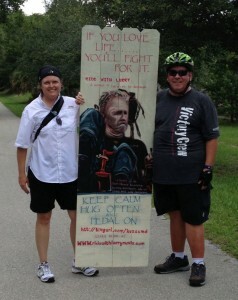 I was privileged to be part of the group accompanying Larry on the final leg of his journey. 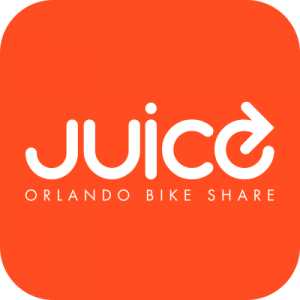 Since I couldn’t make it back to South Dakota for the first anniversary, I organized a “Ride With Larry 2/ Orlando Version.” About 25 area cyclists participated in a 50-mile ride. The credit goes to Jeff Sonsken. He is creating Art & Awareness, one painting at a time. If you would like to support Jeff’s work, here is a link to the “Paint the Trail” Donation Page to help him obtain paint and supplies. His efforts are making this a better and more caring Community. You inspire us, John Alexander. BTW, I love that the “Ride with Larry” panel is flanked by Steve Jobs and Paul Newman. He’s in good company! Betty Smith, Larry’s wife, was also very pleased with the panel’s placement between these two luminaries. My good friends made sure that the RWL location was perfect and I thank them for that.